Go easy on that drill... I want a brew! If you work on a construction site, you probably have to make do with home-made coffee from a flask, or whatever crap the local bakery sells. This is usually because there aren't many places to plug in a proper coffee machine on a job site... until now. Japanese tool maker Makita have created the CM501DZ, a coffee pod machine that draws power from the same batteries that go into Makita power tools. 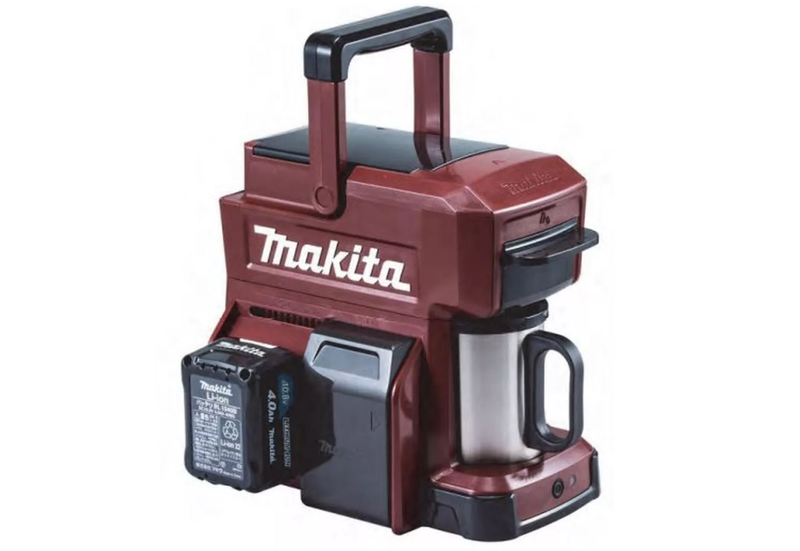 Tough, rugged and hard-wearing, the Makita coffee machine has been designed for outdoor use in rough situations. The great thing here is that power is drawn from a readily available source: the power packs the workmen will already have on them, fully charged. An 18V battery plugged into the machine will offer up enough juice to make about five full cups. The machine doesn't come with batteries, so you need to provide those yourself. That means construction jobs across the world could suddenly take longer, as vital electricity is diverted away from work, and into brewing coffee. Still, this could also be very handy for camping trips (which would be the only reason we own any power tool batteries, anyway).